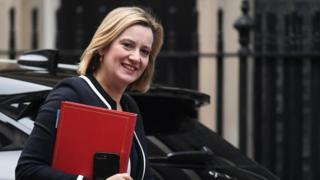 Company bosses could face up to seven years in prison if they mismanage employee pension schemes, says Work and Pensions Secretary Amber Rudd. She wants a new offence of “wilfully or recklessly” mismanaging funds. Ms Rudd told the Sunday Telegraph the law will target “the reckless few”. But one ex-pensions minister says civil, not criminal, action may be better. Sir Steve Webb said it could be difficult and time consuming to reach the higher burden of proof needed in criminal cases. “If you run your company pension into the ground, saddling it with massive, unsustainable debts, we’re coming for you,” Ms Rudd said. Ms Rudd said current rules mean that “acts of astonishing arrogance” by a few company directors are punished with fines “that barely dent bosses’ bank balances”. Under the proposed new law, which still requires Parliamentary approval, courts would also be given the power to levy unlimited fines for mismanagement of pensions. But ex-pension minister Sir Steve Webb said civil action could be more effective. Sir Steve, the former Liberal Democrat pensions minister in the coalition government, said that the criminal offence was “a good headline that risks achieving nothing or worse than nothing”. He said it was difficult and potentially time wasting trying to show, under criminal law with its higher burden of proof, that bosses deliberately underfunded a pension scheme. Sir Steve, now director of policy at Royal London insurance firm, added: “This initiative was first floated before the last general election in 2017. The failures of BHS, with a £500m deficit in its pension scheme, and the outsourcing group, Carillion, with an even bigger shortfall, prompted the government to conduct a review of pension law. A year after it was sold by Sir Philip Green for £1 in 2015, the retailer fell into administration, leaving a £571m pension deficit. Sir Philip agreed later to pay £363m towards it to end action against him by the Pensions Regulator.